We’ve been wanting to have our own control boards for a while now – we’re often asked for recommendations on control boards, and we’ve wanted to have our own option to put forward – an option where we control the quality, where we control the components used, and where we set the specification – because, really, that’s the only way we can know what we’re recommending. That’s why we’re very excited to announce RUMBA+. If you’re looking for a something to step up from an entry-level set of RAMPS electronics, then look no further! RUMBA control boards have long been a popular option – they’re the ideal upgrade, combining the functionality of an Arduino Mega, RAMPS board, fan expansion, LCD adaptor and more all into the one compact form factor. Unlike some control boards that incorporate the easily-damaged stepper drivers into the main board, RUMBA still features replaceable stepper driver modules – so damaged modules can be easily and cheaply replaced, or upgraded with better options as they become available. RUMBA supports up to six stepper drivers, which means triple-extruder or dual-Z dual-extruder builds are doable. Six MOSFET-driven outputs means there’s plenty of room for a heated bed, two hotends, and three independent fans – or any combination you’d like. Three of the outputs can be switched between the raw input voltage and a regulated 12V output, so 12V devices can be used with 24V power supplies. RUMBA control boards are great, but we thought there were a few ways they could be better. We’ve scoured the internet looking for every complaint, grievance, minor annoyance and critique we could find about RUMBA boards, and we’ve taken this feedback on board to design our new RUMBA+ boards! In keeping with the open-source nature of the original RUMBA design, RUMBA+ is fully open source – anyone can make it, sell it, or modify it, and the source is available on GitHub. The PTC thermal fuses used in the original design are the same fuses used in RAMPS boards, and while they’re better than nothing they’re certainly not perfect – they’re slow to react and have a tendency to catch fire right when you don’t want them to, which can be pretty annoying. They also limit the control board to 16V or less, and often make it hard to run larger heated beds without running into problems. We’ve replaced the PTC fuses with automotive-style blade fuses – these fuses are are replaceable, 12-32V compatible, fast to react, and can allow for much higher current limits. Each RUMBA+ board needs two fuses, one higher-current fuse for the heated bed, and a lower-current fuse for everything else. We include two of each, so that spares are handy if you ever run into trouble. A common complaint with RAMPS is that the MOSFETs – responsible for running the heated bed and hotend heaters – are not always up to the job. They get hot quickly, and in the case of the MOSFET responsible for the heated bed, can often fail if they’re running a large bed or not well cooled. The original RUMBA design improved on this by using better MOSFETs, but unfortunately the way they were implemented meant that they weren’t working as well as they should have. We’ve updated the design with newer MOSFETs, correctly implemented – they now run significantly cooler and can handle high-current loads with ease. The MOSFETs on a RAMPS board can burn you if you’re not careful, but with this new design you can comfortably sit your finger right on them. This means they’re not going to wear out, they’re not at risk of catching fire, and they’re not wasting power – after all, the goal is to heat up the bed, not the control board. We wanted to see exactly how big a difference these improved MOSFETs made, and eventually a thermal analysis was done – you can find that here. Here’s one image, showing RUMBA+ (right) and a RAMPS board (left) under identical loads. RAMPS is sitting at a finger-burning max of 81C, while RUMBA+ keeps its cool at 44C. To control the temperature of attached heaters, control boards essentially switch them on and off really quickly to keep them at the right temperature. When the power is suddenly switched off it can cause a reverse voltage spike, which can damage the MOSFET driving the output and, over time, stop it from working correctly. The magnitude of this reverse voltage is related to the inductance of the load being driven – fortunately for us, resistive heating elements tend to have little in the way of inductance. This is true of the small cartridge heaters used in hotends, but the large traces used in heated beds have larger associated inductances, so heated beds can, over time, damage the MOSFETs driving them. Things like fans are inductive loads, and this means they can easily cause damage to unprotected MOSFETs – more bad news! The most common way to protect against this sort of thing is to place a flyback diode across the output of the MOSFET – so that’s what we’ve done. We’ve included flyback diodes on all of the MOSFET-driven outputs, so they’re all protected and safe to use with inductive loads. Any of the driven outputs can be used to run fans, DC motors, heated beds, lights – you name it! The original RUMBA design includes connectors for most common LCD control boards, which is great – unlike RAMPS, no adaptor is needed and everything is kept tidy and compact. Unfortunately, the original design had the connectors labelled incorrectly – the two connectors were both swapped, and then oriented upside-down, meaning finding the right wiring often depended on a fair bit of trial-and-error (or the luck to run across someone else who’d had the same problem online). We’ve updated the labelling and connecting an LCD control board is now easy as can be! Our new magnetic encoder modules communicate with a printer’s control board over I2C. RAMPS has one such connection, but RUMBA has no specific I2C header – though the needed pins are available in the EXP3 expansion header. We’ve taken the needed pins and added not one, but four connections for I2C communication to RUMBA+! This means that RUMBA+ natively supports up to four of our encoder boards, with no adaptor needed – so you can keep the neat and tidy wiring setup, even with closed-loop control on four axes! 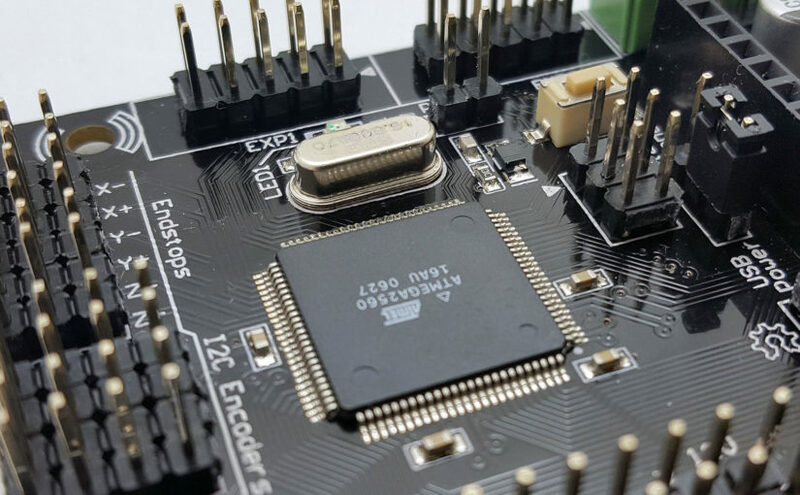 We’ve come across reports that the USB connection on original RUMBA boards could sometimes be a little flaky – so we overhauled that section of the board, improving component layouts to improve reliability. We’ve made the USB subsection functionally identical to the implementation on genuine Arduino Mega 2560 boards – our new RUMBA+ boards even run the same USB to serial firmware, and will identify as an Arduino / Genuino Mega 2560 in the Arduino IDE. We have extensive documentation on the wiki page here, and RUMBA+ can be found in our store here. I am interested but has the RUMBA+ been tested with the FILAMENT_WIDTH_SENSOR and if so can you point me towards some info. I have an Ultimaker 2+ and an Ender 3, The UM2+ controller is showing its age and the Ender 3 controller isn’t the best quality. I’m considering replacing them both with a RUMBA+ controller, do you see a problem in doing that with either of these machines?